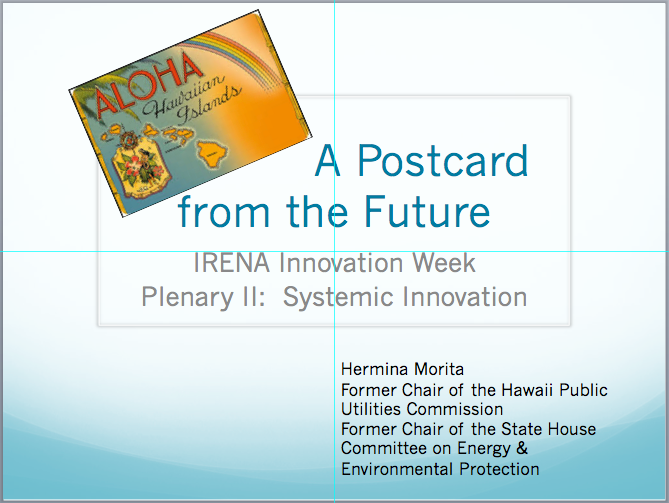 I arrived in Bonn Monday evening to participate as a speaker in the International Renewable Energy Agency (IRENA) first Innovation Week. IRENA is "an intergovernmental organization that supports countries in their transition to a sustainable energy future, and serves as the principal platform for international cooperation, a center of excellence, and a repository of policy, technology, resource and financial knowledge on renewable energy." It has 140 states and the European Union as members. The conference opened with Germany's State Secretary Rainer Baake of the Federal Ministry of Economic Affairs and Energy mentioning that Germany hit a milestone over the weekend, 95% renewable penetration level with its sunny and breezy weather. Later in the program, Irene Canas, the Vice Minister of Energy for Costa Rica mentioned that Costa Rica was at 100% renewable penetration with their hydroelectric, geothermal and wind resources. Both countries accomplishments are impressive but cannot compare to what Kauai Island Utility Cooperative (KIUC) has accomplished in the past five months on an island grid. I had to explain to the broad audience that Germany is interconnected to a larger, continental grid that is more accommodating to the variability of solar and wind. Costa Rica primary renewables are hydroelectric and geothermal which are firm resources. To compare those two situations with KIUC would be like comparing apples and oranges. 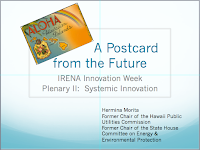 Now I would like to cover why Kauai Island Utility Cooperative is the postcard from the future. 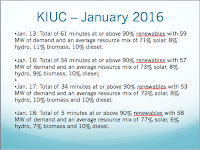 In 2015 KIUC’s annual energy mix was 38% renewables and 62% diesel fuel generation. 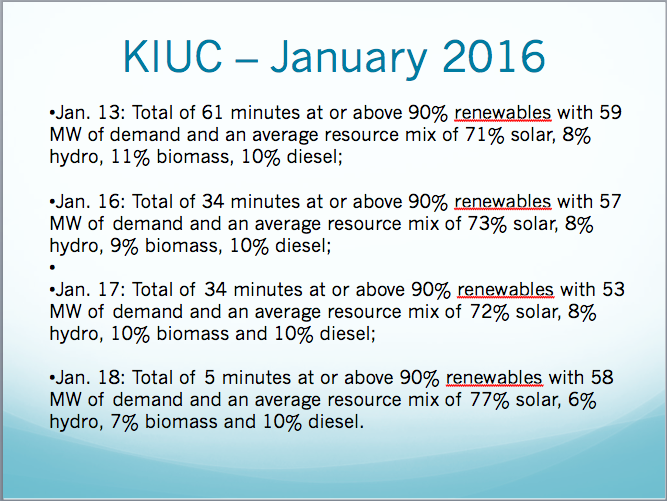 On four occasions in January 2016, KIUC obtained 90% or more of its electricity from renewables. 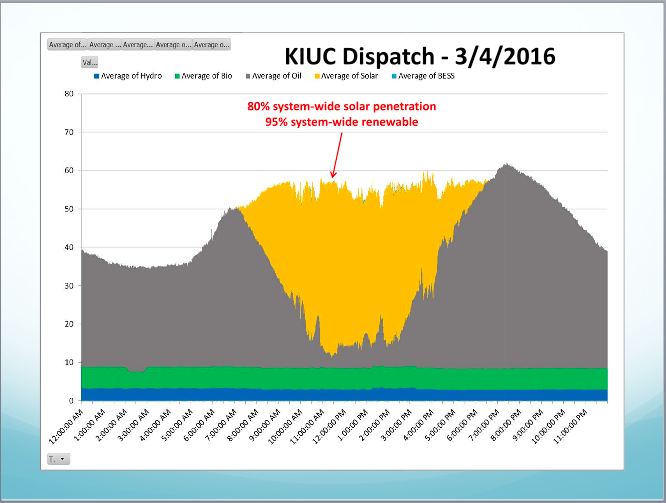 In addition to its baseload capacities of 8% biomass, 7% hydroelectric and ramping diesel generation, KIUC achieved up to 77% solar in its power mix, the most solar ever integrated by a U.S. utility. The 77% that drove the renewable total over 90% was only achieved for short intervals, the longest being 61 minutes on January 13. However, on average in January, solar accounted for about 62% of its generation. 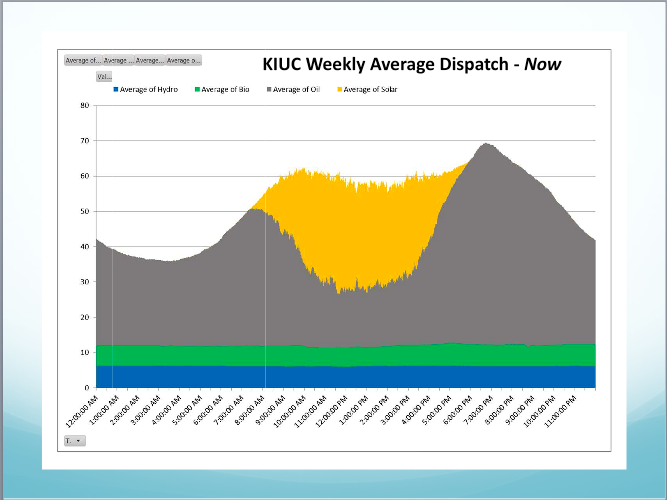 Less than two months later, in March, KIUC topped that feat, integrating more than 95% renewable resources into its system with 80% system wide penetration from solar for durations between 11 a.m. and noon. 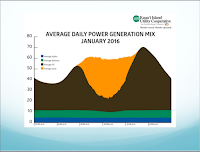 Today, solar making up close to 70% of the utility's generation mix is becoming the norm. To achieve this high integration level, KIUC has batteries strategically located for frequency and voltage control. It has upgraded its conventional diesel generators so they can be more responsive to solar variability. Air permits were modified to allow generators to run at below 50% loads. Generator governors were tuned to ramp faster. Relay protection and load shed schemes were redesigned. Solar inverters and battery inverters were adjusted to ride through wider frequency and voltage excursions. What I learned from my experience is you can make lots of good policies but where the action really happens is in the control room. These operators are confident in their ability to push the envelope and outside of solar, they understand there are few other alternatives to meet state policy objectives, regulatory principles and KIUC's strategic plan. 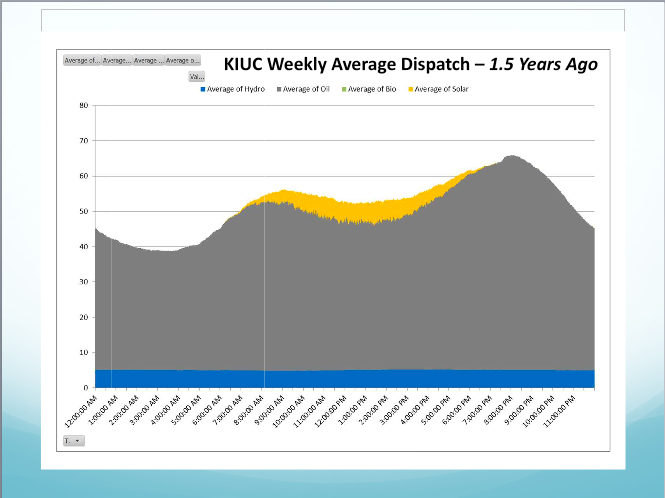 KIUC has achieved a significant milestone where its avoided cost is now utility scale solar, not the avoided cost of oil. Another first for KIUC is its power purchase agreement with SolarCity for electricity from the first utility-scale solar array and battery storage system designed to supply power to the grid in the evening, when demand is the highest. The cost is slightly higher than utility scale solar but lower than the cost of operating its conventional diesel generators during evening peak. KIUC experience relies on the processing of data and its leadership’s ability to analyze quickly and respond. As we move further away from the traditional central power design to integrating more renewable resources comprising of both utility and customer sited systems and unbundling and procuring other ancillary services typically provided by the utility, the utility's primary commodity shifts from electrons to data. This paradigm shift requires the utility to be the aggregator of data that is, the analysis and management of data for the efficient delivery and usage of the cleanest and cheapest electrons while maintaining power quality and stability of the grid at affordable rates. I emphasize data but data is just a subset of the need to adapt to technology in general, which takes the forms of fast communication, and new methods of energy production, storage, delivery and management. 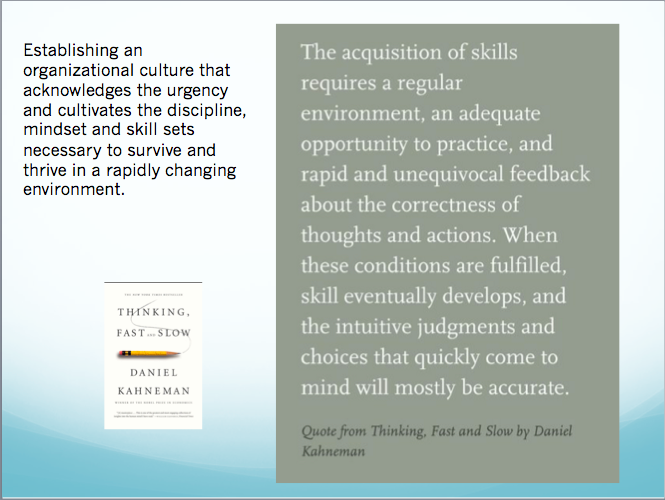 To be able to manage these opportunities and risks associated with new technologies, it will require management teams to be forward looking and rigorous in their thinking, able to develop adaptable strategies and business models, and the discipline to manage by fact and execute well. Management needs to collaborate effectively internally and externally, embrace the need for continuous change and improvement, and to diligently cultivate the organizational culture aligned with these traits. Hawaii’s utilities need to be truly engaged with their customers and deliver a new level of service, ultimately developing stronger loyalty. Otherwise, the utilities will face the medium-term prospect of new and improved distributed energy resources technology and customer dissatisfaction combining to trigger grid defection and, ultimately, compromising the integrity of Hawaii's electricity grid and a clean energy transformation to benefit all residents and businesses, not to mention the financial viability of the utility itself. And they must do all of this amongst great uncertainty and while the utility business model and regulatory structure evolves. I am happy to report that my presentation was well-received and while the non-technical people may not have fully grasped the challenging nature of this feat, the engineers and other technocrats sure did, were wowed and fully appreciated all the modifications that were made to be able to integrate the high penetration level. Other technical presenters referred to it in their presentations. Kauai gave many other parts of the world the confidence of what can be accomplished in a thoughtful and methodical way when there is a commitment to a clean energy future, a good strategy, smart and dedicated people and good leadership.